It was a very steep learning curve however Excelr8 made sure I was as confident as possible both in the car and out, in regards to set up and data. The racing was as tough as I expected, with only tenths of a second separating the top 6 or so drivers and so there was a lot of overtaking which meant I had a lot of close action within a few races. 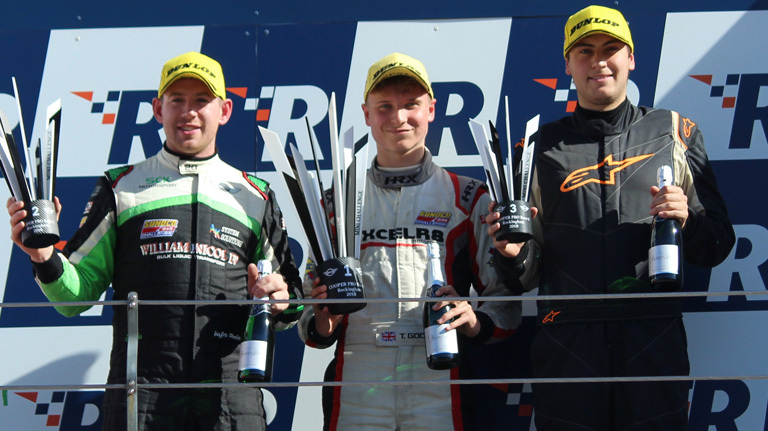 Rockingham was a definite highlight, getting my (and the teams) first and only win of the season. Actually the races at Cadwell were fantastic, some of the best I’ve ever had, the circuit is so difficult and technical but the top 5 of us were running flat out nose to tail from lights to flag. What have you learnt from last season? Mainly race-craft in cars; the step up from karts is big and the whole process of overtaking is much different in a car so that took some time to get used to. The Dunlop tyres were also tricky to get to grips with at first as well as they have so much grip and knowing how to get them up to temperature efficiently in such little time is hard. 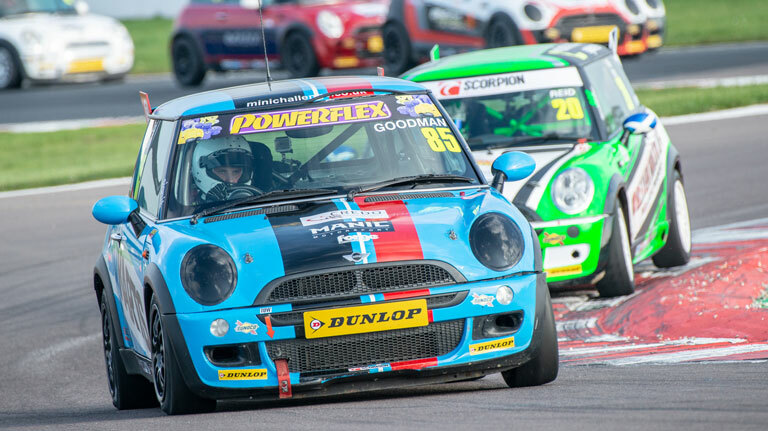 Tyre wear was a huge focus point for us as well, fast flowing tracks like Snetterton kill your tyres and making them last two or maybe three races is something I learnt as the year went on, which definitely helped at Rockingham where minimal tyre degradation was key. With the reverse grid system that the championship has you will almost certainly find yourself at the front of the grid sooner or later and for me it was within the first round! It almost breaks the ice and gets you some experience of starting on pole in a low pressure environment which I found really useful later on in the season. Data is a huge part of the learning curve as well and we found ourselves spending a lot of time early on in the season with engineers and mechanics in the team, picking apart my laps and finding places where I could improve. Not only does it make you go faster, but it also develops a vital skill that you can carry on into most forms of motorsport. We are returning to Cooper Pros for another year and this time we are definitely going for the championship! Last year was fantastic but we couldn’t help but feel like it was cut a bit short with all the success coming right at the end! 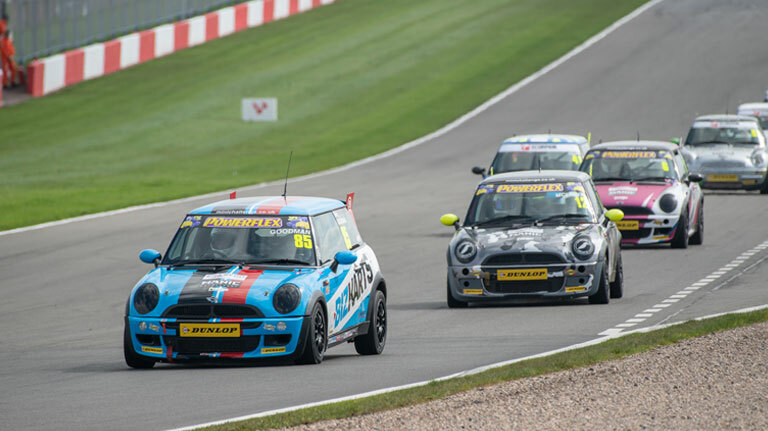 Both I and the team are extremely motivated to win and with the announcement of the Excelr8 BTCC team as well as the JCW and Cooper TOCA package deal, hopefully a successful year can offer an opportunity to take the next step up. 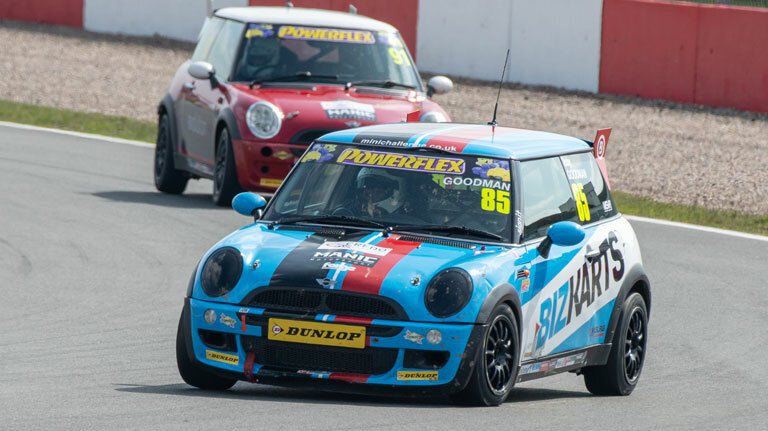 What is it you like most about the Mini Challenge and Cooper Pro Class? I think it’s a fantastic stepping stone for any young driver looking to cut their teeth in an extremely competitive yet fair environment supported by a major manufacturer who is 100% behind a slickly run and promoted series. It’s also not cheque book racing like the top end of karting or some other one make car series where you can buy an advantage through multiple engines and so on, the scrutineering is strong and even if you are on a tight budget you can turn up and run at the front, no problem. Last year gave me some of the closest racing I have ever experienced, yet all rivalry was kept on track, with the paddock area being a friendly and relaxed environment. If I had to pick one thing however it would definitely be the car; it’s a great car to drive with the Dunlop slicks and very accessible for any young drivers but there are enough setup challenges to get you thinking and learning, ready for the next step up.